At his first AKC weekend out, Hippie won the Bred By Exhibitor class at two of the six shows, including RESERVE WINNER'S DOG at the Greater Atlanta Dalmatian Club Specialty under breeder/judge Robert Stein. His first point came on the competitive Florida January circuit under breeder/judge Jim Hamm. Hippie picked up his first major at the DCGA speicalty supported entry in Atlanta, a second major in Biloxi, MS and a third major in Deland to finish his Championship title at 16 months old! 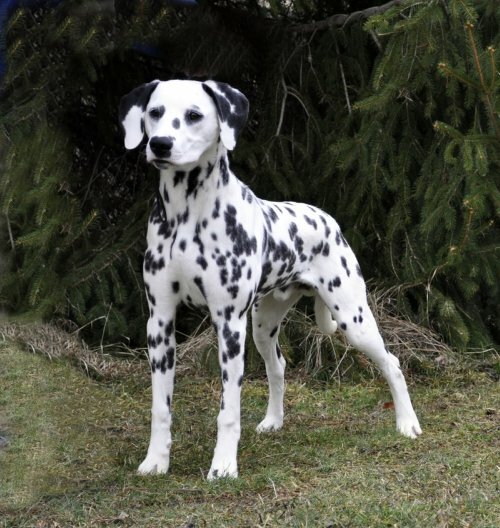 On the performance side, Hippie is a true Woodwynd Dalmatian! Training in both obedience and agility, Hippie is already titled in Dock Diving as a Senior Jumper and has earned his Coursing Aptitude title! Owners: Amy Marrich & Mary-Lynn Jensen, Ph.D.